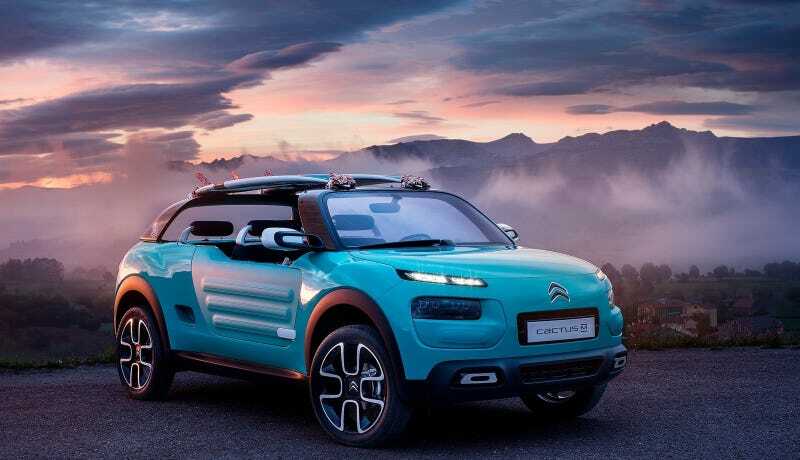 Citröen is going to show off a new two-door Cactus M Concept, which is perfect if you are European and live an active, beach-going lifestyle and always wanted a Citroen Méhari. The Cactus M Concept will be washing up at this year’s Frankfurt Motor Show, boasting a ton of design details that throwback to the totally gnarly plastic-bodied light offroader Méhari of the 1970’s. Like its classically awesome predecessor, the Cactus M Concept is a light off roader with an open top designed to let the outside in and beat the elements. Featuring plastic AirBump body paneling, specially hinged extra-long doors, and a completely weatherproof interior with surfaces designed to resemble a wetsuit and drains in the floorboards, this thing is perfect for beach bum fun in the sun. If you set the driving mode from “Sand” to “Snow” and need a roof, the car features a unique inflatable stowaway roof. If you’re too good for a hotel, or too far away, feel free to use the extendable tent that pops out of the back of the M Concept - big enough for you and one other. When your bright colored adventures come to a conclusion and it’s time to clean up, feel free to just hose off the exterior and interior. No shore-showering before clambering you and your friends to the nearest bar/restaurant after a long day of beachgoing. “It looks like a Jeep Cherokee got into a knife fight with a Nissan Murano Cross Cabriolet,” says Collin Krum of FlightClub. The Cactus M is probably the best possible result of a knife fight I’ve ever seen. Man, this thing is awesome. I want it. I can’t have it. No, not even in Hawaii, the state the color is named after.